Photo Opportunity: Banners, floats, and people in costume representing the extractive industry. 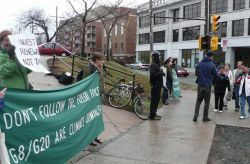 Toronto – Environmental, climate and mining justice activists have taken to the streets today to expose the devastating environmental and social impacts of Canadian extractive industries at home and abroad. The Toxic Tour is winding through Toronto, using creative action to highlight Canada’s, and the G8 and G20’s, roles in perpetuating these monstrous industries, and showcasing grassroots solutions that benefit our communities and safeguard the planet. 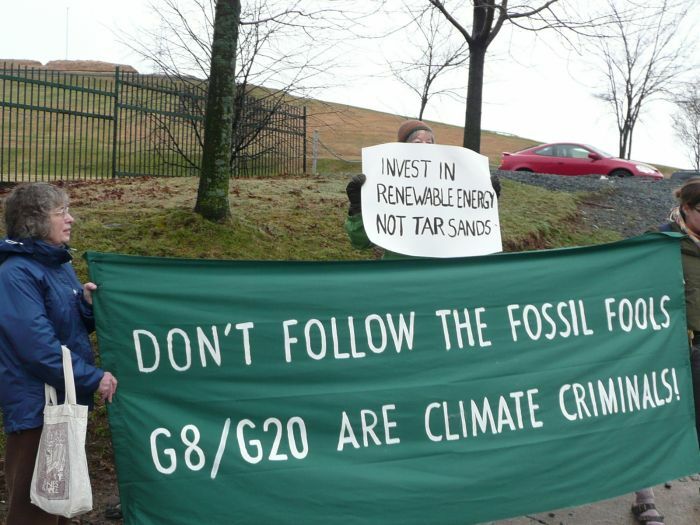 Climate justice activists point out that the G8 and G20 represent over 80% of global greenhouse gas emissions, and are historically responsible for bringing the world to the brink of climate chaos. Canada alone bears a climate debt of at least $8 billion per year to communities in the global south, communities of colour and Indigenous communities here in North America who will be hit hardest, and first by climate change. Collectively the G8 owes $141 billion per year in climate debt to the global south. Canadian is home to over 75% of companies involved in environmentally and socially destructive mining projects around the globe. The Canadian government subsidizes global mining projects, including 2 billion dollars a year in oil and gas subsidies. Mining and climate in-justice come together in Canada, home to the largest, most destructive project on the planet, the Athabasca tar sands in northern Alberta. The Toxic Tour started at 11:00 am at Alexandra Park, corner of Dundas & Bathurst, and features creative visual actions including a bitumen march, floats, and a few surprises! Speakers included Jasmine Thomas, Riannon Ball, and Mel Basil from First Nations communities resisting tar sands pipeline developments representing the Defenders of the Land Network, and Naty Atz Sunc and Isaiah Kipyegon Toroitich from the KAIROS Climate Justice Tour. 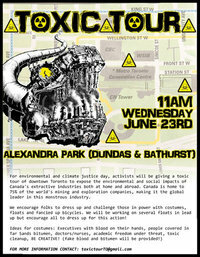 The Toxic Tour is part of the Environmental and Climate Justice Day of Action in the themed days of resistance called by the Toronto Community Mobilization Network. 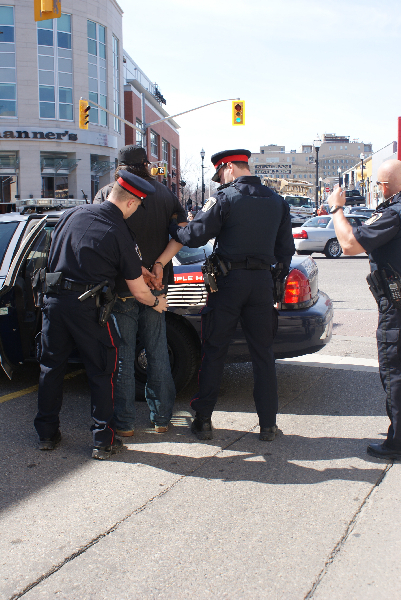 The Waterloo Police chose to protect the corporate interests of the Royal Bank of Canada and arrested a peaceful protester after he dropped 2 banners from an uptown branch of the RBC. Indigenous Rights activist, Mark Corbiere, 25, who lives in Kitchener (on the Haldimand Tract), was arrested and charged with mischief under $5000 for his part in dropping two banners which read “Boycott RBC” and “Create a Better Canada, Stop the Tar Sands” respectively. The Royal Bank is the most prominent financier of the tar sands industrial project which is devastating the heart of the boreal forest in central Canada. 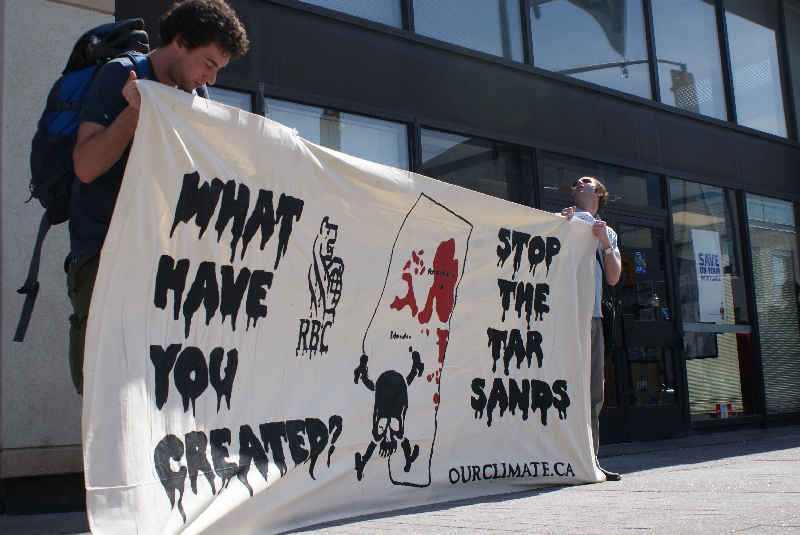 As the banners dropped a loose network of citizens, under the name People for Climate Justice, unfurled another banner which read “What Have You Created RBC” with a skull and cross bones over a map of Alberta, with the tar sands highlighted in red. 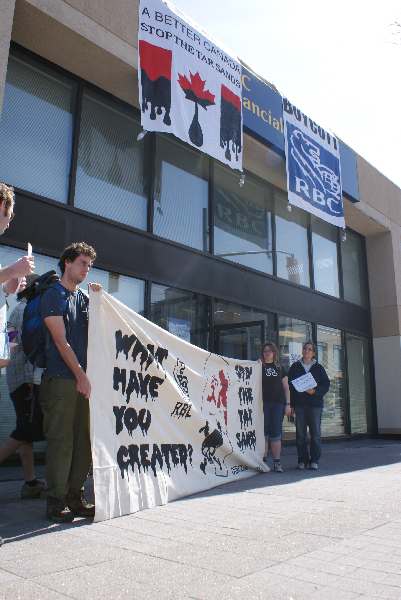 This banner was at the doors of the RBC and the group started to speak to those assembled in the nearby public square. 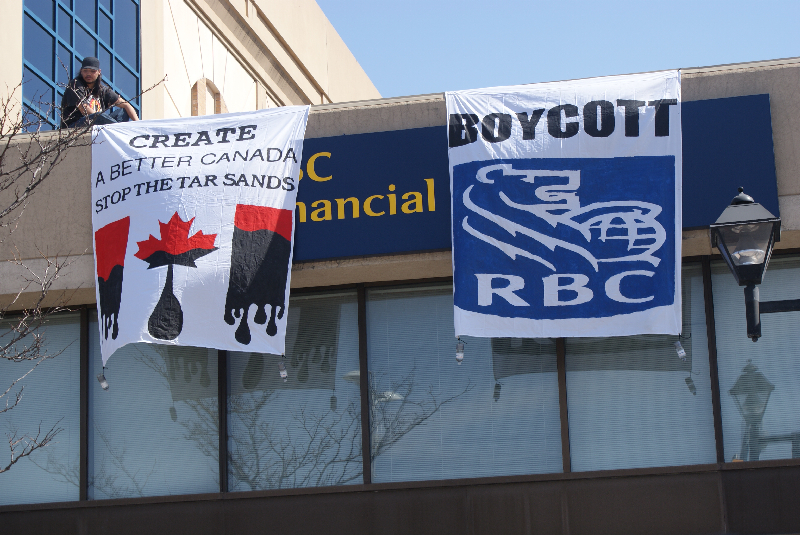 While revealing facts about the tar sands with a megaphone, the climate justice advocates urged RBC customers to withdrawal their support for the tar sands by closing their accounts with the RBC. This message reached a few customers who left the RBC without completing their transactions, and took time to speak with those bringing out these truths. Many passersby showed support or stopped to chat with the well informed group about RBC, tar sands, climate change, and stolen land. An unidentified women from Alberta spoke of the toxification of the water sources in the areas around and downstream of the tar sands. She also relayed “I don’t want to be in the sort of world that needs duck rakers!” referring to the crews of workers who rake the dead ducks from the mining operations tailings ponds’ each night. Counter to their negotiated claims (as a manager from the RBC branch apparently vetoed them), the police arrested Corbiere and violently stole him away from his allies, they also took the banners as “evidence.” While a crowd of people were waiting for Mr. Corbiere to be released by his captures, 5 police approached them, took their pictures and threatened to arrest them if they did not take their banner off the police station. The police also indicated that the peaceful presence of Corbiere’s allies in the public park near the police station was causing them to “take longer” as they had to “deal with” the group. This mirrors what the arresting officer threatened when Mr. Corbiere was first arrested. MONTREAL – On Thursday, April 1, 2010, a group of over 70 left Dominion Square in the heart of Montreal to make the 15 km journey to the city’s east end to shine a light on the largest urban oil refining center in Canada. Drawing contingents of activists from various student, social and environmental justice groups, the Bike Bloc organized by Climate Justice Montreal made its way down Rene Levesque to Berri and up to Sherbrooke Street, heading on a collision course with the Enbridge Trailbreaker Tar Sands expansion pipeline. Bikers Occupy the Road as two climbers from CJM hoist a massive banner. Photo Cred Tristan Glenn. The bikes entered the post-apocalyptic petroleum wasteland just beyond the last metro station, passing first by Shell Canada’s Montreal Development. The massive refinery has recently been put up for sale, announced by “A Vendre” signs lining the road, proudly offering up “800 skilled employees” as part of the package deal for any eager buyer. “Rather than expanding the petroleum infrastructure that is destroying ecosystems and communities, we need to build a clean energy economy, creating meaningful jobs for thousands of people including those working at the Shell Refinery. Our society needs jobs that are not dependent on unstable, destructive resources that soar and crash, creating environmental and economic catastrophes,” says Cameron Stiff, a local sustainability organizer and activist. As the bloc moved further east they crossed paths with an imposing concrete slab home to the Trailbreaker, set to send 40,000 barrels – of a daily 200,000 that will pass through the city – of dirty bitumen sludge for refining in Montreal. The bikers set up a circular road blockade, as two climbers unfurled a 10 meter banner declaring “Changeons le System! Pas Le Climat!” (system change not climate change!) 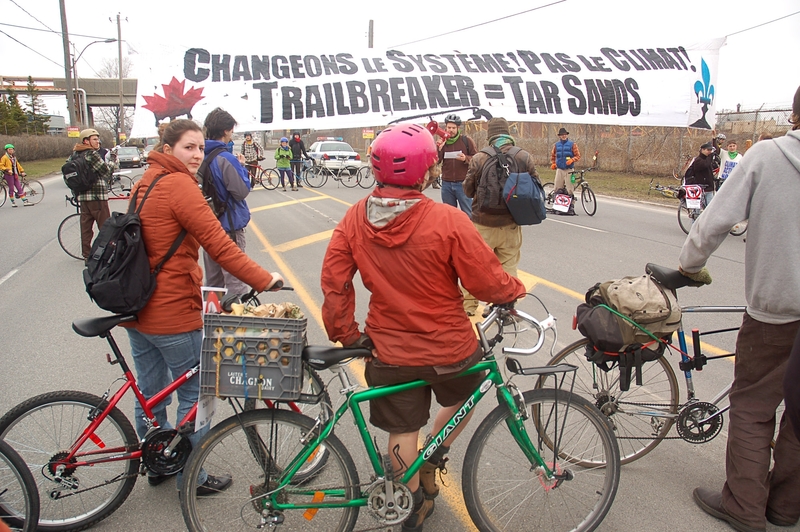 pointing to the Trailbreaker as the physical manifestation of the Tar Sands in Montreal. A number of speakers pointed to the Tar Sands impacts on the Boreal forest, the Athabasca and Mackenzie watershed and the danger they pose for pushing Canada and the world towards a climate tipping point. Special emphasis was given to the danger they pose for downstream communities, such as Fort Chipewyan, who face poisoned water and toxic air each day. “We’ve done a lot to create the problem [of climate change] and done nothing to solve it,” says Emily Rideout, one of the participants in Fossil Fools Day actions in Halifax. David Bush is with the Canadian Youth Climate Coalition, the organizers of Fossil Fools Day in Halifax. As part of today’s actions, they’ll be holding simultaneous pledge drives at campuses across the city, encouraging students to sign the G20 Youth Climate Pledge, and promise to take action to hold the Canadian government responsible for its failure to take action on climate change. Climate change is “a justice issue” according to Linda Scherzinger, a member of the Nova Scotia Coalition for Climate Action and the Interfaith Coalition for Climate Justice. “The people who are suffering the most and will be suffering the most in the future are people who have not been part of the cause,” she says. Rideout agrees. She points to how the Canadian government failed to consult with First Nations downstream from the tar sands, who are being disproportionately impacted by the pollution. “Canada has a moral obligation to act,” says Rideout, who his not optimistic about the current government making change. “I’m optimistic about change happening from the bottom up,” she says. Fossil Fools Day 2010 is taking place April 1st and there will be actions happening all across Canada. Today is Fossil Fools Day, an international day of action to hold dirty politicians and industries accountable for expanding a fossil fuel industry that is quickly destroying our planet and our communities. In Canada, the biggest Fossil Fools are Tar Sands developers, investors and political supporters responsible for the dangerously short-sighted expansion of the largest and dirtiest industrial project on the planet. SO WHO IS THE BIGGEST FOSSIL FOOL IN CANADA? We are calling out Canada’s Fossil Fools for their relentless commitment to expanding the Tar Sands, the most destructive project on earth. •	Canada has gained a high international profile as a human rights abuser and climate criminal. First Nations communities have experienced violation of treaty rights, loss of land base and increased health concerns associated with tar sands extraction. •	Our window of opportunity to transform the economy, create millions of new green jobs and be a world leader in clean energy is being overshadowed by an addiction to oil, power and greed, benefitting the Fools at our expense. •	Canada’s commitment to the Kyoto Protocol to reduce greenhouse gas pollution has been ignored by our government. •	Canada is leading the planet towards dangerous and irreversible climate change. The movement to shut down the Tar Sands has exploded and all eyes are now on Canada’s fossil foolery. Youth in Canada and internationally will not allow Canada’s Fossil Fools to sacrifice our future for short term profit. If we’re going to stop climate change and respect aboriginal treaty rights, the only real solution is to keep fossil fuels in the ground! Check out the map below for all the actions happening in Canada. Vote for the biggest Fossil Fool! 1. Check out the Fools’ bios and nomination videos. Then Vote for the Fossil Fool of your choice! And vote for as many Fools as you want. 2. Change your profile pic in celebration of Fossil Fools Day. Find images below and include a link to our site in the description of your pic. 3. Pull your own Fossil Fools Day prank! Call or email your favourite Fool and thank them for showing real leadership and shutting down the Tar Sands. Call the nominated Canadian MPs at 1.866.599.4999. If they are not there, ask to leave a message or you can Tweet the Fools! Use the hash tags: #G8, #G20, #Fossil Fool #TarSands #Cdnpoli, and #climate. Let’s make this Fossil Fools Day count! Fossil Fools Day se déroule aujourd’hui, c’est une journée internationale d’action pour tenir responsable les politiciens et les industries grossiers pour l’accroissement de l’industrie des combustibles fossiles qui détruient rapidement notre planète et nos collectivités. Au Canada, les plus grands “Fossil Fools” sont des développeurs et investisseurs des sables bitumineux ainsi que les partisans politiques responsables de l’expansion imprévoyant du projet industriel le plus important et obscène de la planète. ALORS, QUI SONT LES “FOSSIL FOOLS” DU CANADA? •	Le Canada a acquis une grande visibilité internationale en tant que violateurs des droits humains et le climat pénale. La collectivité des Premières nations a subi la violation des droits issus de traités, la perte de terres et l’augmentation des problèmes de santé associés à l’extraction des sables bitumineux. •	Notre fenêtre d’opportunité pour transformer l’économie, créer des millions de nouveaux emplois verts et être un leader mondial dans l’énergie propre est éclipsée par une dépendance au pétrole, le pouvoir et la cupidité, à la faveur des imbéciles à nos frais. •	L’engagement du Canada envers le protocole de Kyoto pour réduire la pollution de gaz à effet de serre a été ignorée par notre gouvernement. •	Canada dirige la planète vers un changement climatique dangereux et irréversible. Le mouvement pour arrêter l’exploitation des sables bitumineux a explosé et le regard mondial est désormais sur les bêtises des fossiles du Canada. Les jeunes au Canada et à l’étranger ne permettra pas aux “Fossil Fools” au Canada a sacrifié notre avenir pour les bénéfices à court terme. Si nous allons arrêter le changement climatique et respecter les droits autochtones issus de traités, la seule véritable solution est de garder les combustibles fossiles dans le sol! Jeter un coup d’œil sur toutes les actions qui se passe au Canada. Votez pour le plus grand “Fossil Fool” au Canada! 1. Votez pour le “Fossil Fool” de votre choix! Votez pour autant d’imbéciles que vous le souhaitez. 2. Tirez vos propres blagues de poisson d’avril! Appelez ou écrivez à vos favoris imbéciles et remercier-les d’avoir fait preuve de leadership réel et d’arrêter les sables bitumineux. 3. Changez votre photo de profil à l’occasion de Fossil Fools Day. Trouver des images ici et inclure un lien vers notre site dans la description de votre photo. Appelez les députés canadiens nominés au 1.866.599.4999. S’ils ne sont pas là, demandez de laisser un message ou vous pouvez Tweet le texte en gras ci-dessous! Utilisez les balises de hachage: #G8, #G20, #Cdnpoli et #climat. Faisons cette journée, Fossil Fools Day, compter!